Before we begin this article we would like to acknowledge the contributions of Jim Cate and Martin Krause to the study of the firearms made by J.P. Sauer and Sohn. Their book, Automatic Pistols of J.P. Sauer & Sohn: A Historical Study (also known as J.P. Sauer & Sohn, Volume II), is a landmark in the field. Without their book, and particularly the knowledge and guidance offered by them in personal correspondence, this article would not have been possible. Any errors, however, are our responsibility alone. The city of Suhl was first mentioned in documents in the year 1318. It is located in Thuringia, Germany, and is famous for its long tradition of weapon manufacturing. Firearms were first produced there around 1500. It is reported that in the beginning of the 17th century the SAUER family moved from Nuremberg to Suhl and founded their gunsmith business. The family has continued to work in Suhl ever since. Johann Paul Sauer was born in 1720 and started the gun business in 1751. J.P.Sauer, Jr. was born circa 1755, and his son Franz Sauer was born circa 1790. Franz had 2 sons, Rudolf (born circa 1839) and Franz Jr. (born 1840). Franz Jr. had 2 sons: Hans (born 1875) was a former technical director and died in the Sachsenhausen prison camp in early 1945. Rolf (Rudolf) was born in September 1882 and died in January 1972. He was the former sales director of the firm in Suhl. Rolf had 3 children: Franz Joachim, Gisela, and Dietrich Rudolf. In 1811 Sauer became the first company ever to produce firearms for the German military. Because of this, a new facility was begun in 1837 and completed a year later. By 1858 two hundred people were employed by Sauer. During the wars of 1864-66 as well as 1870-71 the production of military rifles was increasingly important, and another new facility was completed prior to 1871 when Sauer was called upon to help Mauser produce the Modell 71 military rifle. Later the gun was modified and designated the Model 71/84. In 1880 Sauer & Sohn also began production of high quality hunting rifles, which became well known very quickly and are still highly sought-after today. During the early years of the 20th century (between 1903 and 1910) Sauer contracted to make an automatic pistol for Georg Roth, an Austrian ammunition magnate. Roth’s original design was being manufactured by Steyr as the Roth- Steyr, a military pistol designed for use by the Austrian cavalry, with a long-recoil rotating barrel lock mechanism. The Roth-Sauer was a pocket version of the same pistol, firing a cartridge known as the 7.65mm Roth (which is apparently nearly identical with the 7.65mm Frommer cartridge). The Roth-Sauer pistol was listed in the 1910 Deutsche Waffenfabrik Georg Knaak catalog. By 1900, Sauer & Sohn had also gained considerable experience in revolver manufacture, having received two revolver contracts, in conjunction with C.G. Haenel in the first instance and with V.C.Schilling in the second. These pistols were known as the Reichs revolvers. But with the growing market for self-loading pistols, Sauer had to catch up. First they produced the Bär -Pistol under license from Burkhard Behr. It is a double barrel pistol having a flat rotating block with four chambers. By pulling the trigger the first two rounds can be fired, after which the block must be turned manually before the next two rounds can be fired . The pistol appeared in catalogs in 1910 but was not very popular, partly because it wasn’t very practical, but also due to competition from FN, Mauser, and other companies that were making self- loading pistols. The fact that Sauer & Sohn’s Bär-Pistol did not sell well, and their experience manufacturing the Roth-Sauer, probably encouraged them to begin developing a self-loading pistol of their own design. 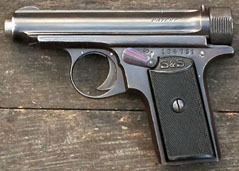 With a preparation time of two years the first Sauer self-loading pistol in .32 ACP was released in 1913, having been designed by Sauer’s chief engineer, Fritz Zehner. The Model 1913 was of very high quality manufacture and gained an early reputation for reliability. During the production period from 1913 to 1929 the gun was modified twice (see below for details). In 1920 Sauer introduced a 6.35mm (.25 ACP) version of the Model 1913 which was designated the Model 1919. Three variants of the Model 1919 are known. In 1926 Sauer introduced the Model 1926 Export pistol, which was an improved Model 13. The Model 1926 was finished quite beautifully and the majority were exported to the U.S. Only a few thousand were made, making it a very desirable pistol. 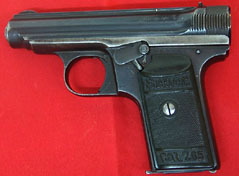 Due to competition from the Walther Model 8 and Model 9, Sauer was also forced to produce vest pocket pistols, which are known as the Model 1920, 1928 and 1933. These models are not covered in this article. In 1930 the Model 1913 was redesigned and the new pistol was released as the Model 1930. It had more ergonomic grips, better balance, and a few other different features than its predecessor. Shortly after that Sauer began making further improvements and in October 1930 the Behördenmodell 1930 appeared, which was focused on state customers. This model had interesting features such as a trigger safety, similar to the modern Glock pistol. But with the Walther PP and PPK Sauer had strong competitors. So in 1938 a totally new pistol, the Model 1938, was introduced. This article will focus on the Model 1913 and its successors, the Models 1919, Model 1926 (which is a variant of the Model 1913), the Model 1930 and the Behördenmodell 1930. Sauer & Sohn had several patents and utility models on the Model 1913 and its successors. German Patent No. 229594 (23 January 1910) for the lockwork with the trigger bar being disconnector and sear in one piece. German Patent No. 259618 (4 July 1912) for a magazine safety which must be, once activated, disengaged with a release button. German Patent No. 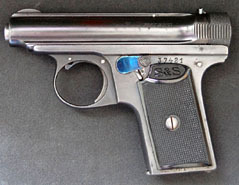 485710 (24 October 1929) which describes the trigger safety of the Behoerdenmodel 1930. The safety consists of a small button on the surface of the trigger; if this button in not pressed, the trigger will not move. So the gun is safe even if it the ordinary safety lever is in fire position. So even if the gun is dropped it cannot fire. In Germany, patents extend protection for 18 years (15 years before 1923). A patent requires that the invention be compared to previous patents to verify that it is unique. A lesser form of protection is the Gebrauchsmuster, or Utility Model, which extends protection for a simple invention for a period of 6 years and does not require an examination to prove it is unique. All a company or individual has to do is to register a Utility Model and provide a title and description of the invention. After 10 years the utility model paperwork is destroyed, and all that remains in the record is the number and title of the invention; whereas patents are published and remain available for examination in perpetuity. DRGM 428801 (10 February 1910) titled Verschlußhülse für Pistolen (Tubular slide lock for pistols). DRGM 447929 (25 January 1910) titled Abzugsvorrichtung mit Fangstange für automatische Handfeuerwaffen (Trigger mechanism with a connector bar catch for automatic small arms). DRGM 511398 (21 May 1912) titled Selbsttätige Abzugssicherung an selbstladenden Handfeuerwaffen (Self-acting trigger safety for self-loading small arms). DRGM 520984 (15 July 1912) titled Fangvorrichtung für die Verschlußhülse an selbstladenden Handfeuerwaffen (Locking-catch mechanism for the tubular slide of self-loading small arms). DRGM 547411 (12 September 1912) titled Sicherung für selbstladende Handfeuerwaffen (Safety for self-loading small arms). Chief designer Fritz Zehner may have been influenced by the design of the Savage Pistol, which can be recognized in the overall shape of the Model 1913 and in its concentric recoil spring and separate breech block assembly. However the Sauer is a totally different gun, with a fixed barrel and unique lockwork. The Model 1913 guns, all the way through to the 1930 Behördenmodel, have a tubular slide, the forward portion of which encloses a fixed barrel with a concentric recoil spring. A separate breech block fits into the rear of the tube and is held in place by screw cap. The vast majority of the Model 1913 display the following slide inscriptions in italic capital letters. Top: J.P. SAUER & SOHN, SUHL. followed by the trademark of the S&S company: an oval with a wild man holding a mace or club. However, there were variations. Through at least serial number 4282 guns intended for export to English-speaking countries were marked on top of the slide: J.P. SAUER & SON, SUHL, PRUSSIA. There are three known variants of the Model 1913 which have minor differences. 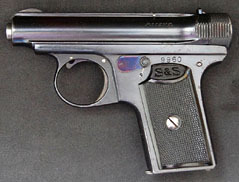 Model 1913, Variant 1 – serial number 1 – 5000, with some transitional pistols noted in the 5000 to 8700 range. from German Patent No. 229594. The Model 1913 connector is of the stirrup-shaped Browning type, which runs on either side of the magazine, then joins in the rear. The Model 1913’s sear is not a separate piece, but instead is a chisel- shaped projection on the rear of the connector itself. A flat spring in the rear of the grip tensions the connector/sear in the upward direction, while the firing pin spring serves to tension it in the forward direction when cocked. When the gun is not cocked, the pivoting trigger remains flat in the back of the trigger guard. When the striker is cocked, the tension of the striker spring pushes the connector/sear forward, which in turn pushes the trigger forward. So the shooter with his finger on the trigger can easily see and feel if the gun is cocked or not. Disconnection is accomplished through the design of the trigger and connector interface. The trigger is essentially disconnected from the connector as soon as the gun is fired. The connector rides up over the top of a projection on the rear of the trigger when there is no forward tension from the striker spring, leaving the trigger slack. The slide latch is located in the upper part of the trigger guard, and is an extension of the trigger, such that if the slide is locked open one need only pull the trigger to release the slide. The fixed barrel has a two-pronged cartridge guide protruding from the top of the chamber. Most first variant guns do not have a separate rear sight as do later variants. Instead the breech block screw cap has a V- shaped notch which serves as the rear sight. The screw cap is secured in position by a spring-loaded pin built into rear of the breech block, which fits into a hole in the back of the cap when it is screwed all the way in. The cap has serrations on its sides; the serrations do not extend onto the slide of the pistol. Somewhere near serial number 4991 a separate rear sight was added in the form of a flat spring with the sight on the end, which also serves to hold the rear cap in position. Some earlier guns were converted to the new rear sight arrangement, and may still have the original screw cap with the groove and hole in the rear. The first variant is primarily distinguished by a magazine safety with a release button on the left side just behind the trigger. Removing the magazine causes the safety button to pop up, locking the action. Even when a new magazine is inserted the trigger remains locked. To deactivate the safety, the magazine safety button must be depressed. Obviously, this was overkill, and the magazine safety was quickly eliminated. The manual safety locks the trigger only, preventing it from engaging the connector bar/sear. The early guns have no markings for the safety lever positions. Down is the safe position. The thumb grip portion of the safety lever is checkered. The grip plates are plain checkered hard rubber, squared at the bottom and rounded at the top, with only a tiny half-moon cutout for the safety lever on the left side. Like the 1900 Browning, the magazine is released by squeezing the magazine release on the bottom of the grip toward the front of the gun, rather than to the rear. Transitional pistols have the old frame with the magazine safety button, but have the new slide with the flat spring rear sight (described below) and the new style grips. The magazine safety was eliminated and the rear sight was improved. Instead of the V-shaped notch the gun has a flat spring on top, the rear portion of which forms the rear sight and also secures the breech cap. (This flat spring latch and sight is reminiscent of the sight for the Bär pistol, which also served as the release for the rotating block. The hole in the rear of the screw cap is eliminated. The gun continues to have serrations only on the sides of the screw cap, and not on the slide. There is an “S” beneath the safety lever to indicate the gun is safe when the lever is down. The thumb grip portion of the safety lever has circular grooves through at least serial number 32121. The circular grooves are replaced by checkering by at least serial number 36790. The hard rubber grip plates are only slightly rounded at the top, with a distinct cutout at the upper left corner to accommodate the motion of the manual safety lever, and the S&S monogram in an elongated oval at the top. The efficacy of safety levers on automatic pistols was becoming a topic of discussion in this time-period. Since the safety lever on the earlier 1913 Sauer pistols only blocked the trigger, if the gun were dropped inertial motion could still cause the gun to fire. 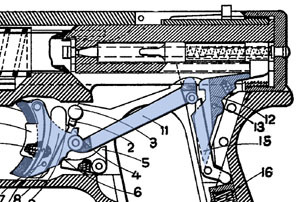 Sauer decided to address this problem by placing an additional spring-loaded lever beneath the existing manual safety lever. When the safety lever is moved down, it presses the additional lever into a slot cut in the left side of the connector/sear, effectively locking it. Now, if the gun is dropped, it cannot fire. This was called the Zusatzsicherung, which means “additional safety.” Some of the guns between serial numbers 128500 and 130800 are marked in English for export. The hard rubber grip plates are again only slightly rounded at the top. The S&S monogram is now in a vertical oval filling the upper half of the grip plate. This gun was originally called the Export Model, and only later named the Model 1926. In 1926 the safety lever was provided with a nose which is used to lock the slide in its rear position. The slide catch in the trigger guard is eliminated (as the slide is now held open by the nose of the safety lever). The Zusatzsicherung is retained, and the internal lockwork is identical to the Model 1913, Variant 3. 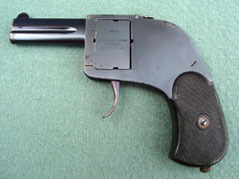 The frame retains the square-cut grip of the Model 1913, however the trigger guard is now oval shaped, rather than round, and its bottom runs parallel with the slide. The serrations extend from the screw cap onto the slide. The old-style magazine is retained, so the Model 1926 has magazine interchangeability with the Model 1913. 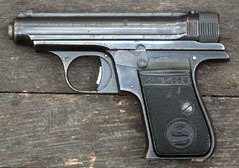 The earliest Model 1926 guns had grips like the Model 1913 variant 3, but later the hard rubber grips show the word “Sauer” in a rectangle at the top and “Cal. 7,65” in a rectangle at the bottom. Only about 10,000 of these guns were made, making this model relatively rare. There is some crossover of serial numbers between the Model 1926 and the Model 1930.
made, particularly the design of the cartridge guide and the magazine release for the Model 1929 and subsequent guns. In addition, Cate and Krause’s J.P. Sauer & Sohn, Volume II, page 144, documents the input of Otto Busdorf, who was a Kriminalkommissar (detective superintendant) of the Prussian police. Busdorf states in his 1929 book, Wilddieberei und Forstermorde, as translated by Krause: ‘The well known firearms company Sauer & Sohn in Suhl has developed on my suggestion a new automatic pistol Cal. 7,65mm with a trigger-lock safety, a magazine safety and a triggerbar safety which will be placed on the market in the near future. It will be known as the “Behördenmodell” and will fulfill the requirements of the present period.’ Busdorf was concerned with providing a safe and reliable handgun for the Prussian forest rangers or game wardens. With the post-war German economy in desperate straights, poaching of game was a serious problem and a number of land-owners and game wardens were murdered while trying to interdict poachers. 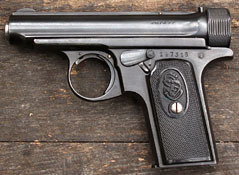 The Model 1929 is essentially a Model 1930 with a few changes that were requested by the Dutch police and military (see the Model 1930 below for its design features). 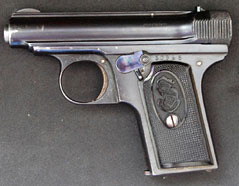 The Dutch police specifically requested that the trigger for their guns retain the functionality of the Model 1913, wherein the trigger remains flat in the back of the trigger guard until the gun is cocked, when it springs forward. The Dutch pistols also have a cocking indicator on the back of the gun--a small pin protrudes from the center of the end cap when the gun is cocked. They also required an extra screw and coil spring at the bottom of the rear grip-strap, to put additional pressure on the magazine latch. Early versions are marked JOH.MUNTS - AMSTERDAM on the left side of the slide and J.P.SAUER&SOHN,SUHL on top. Johan Munts was the Dutch importer. Later versions have these markings reversed, and the top of the slide is engraved with fine lines to reduce glare. Serial numbers noted thus far are 186130, 186153, 190908, 220135, and 225740. It is not known exactly how many were produced. The Model 1929 does not have a magazine safety. The police model usually has a horizontal lanyard near the bottom of the left-side grip, with a cutout at the base of the grip plate to allow for it, and the grip plates are normally black, but are sometimes seen in a distinctive green with a wood-grain effect. The Dutch government was purchasing Sauer Model 29 pistols for different agencies such as the Dutch Navy, S.M.N. (Steam Ships Netherlands), D.v.F. (Department of Finance), etc. These guns are quite rare. 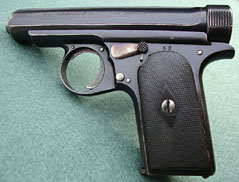 In the 1928-1929 time period the Model 1913 design was improved. 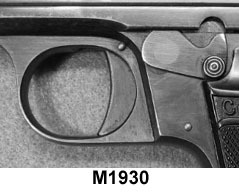 The new gun was named the Model 1930. The internal design of the lockwork remains the same as on the Model 1913. The grip has a coil spring (instead of the earlier flat spring) at the rear to tension the sear and magazine release. The grip is reshaped to be more ergonomic and fit the hand better. The magazine latch is redesigned to be pushed to the rear to release the magazine. This also required the magazine to be redesigned, and so the Model 1913 magazine cannot be used in the Model 1930. 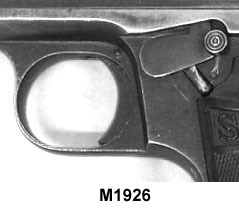 The slide holdopen mechanism of the last variation of the 1913 and the 1926 Export model is retained, though the trigger is redesigned so that it does not sit in the back of the trigger guard when the gun is uncocked. A magazine safety is introduced, which prevents the gun from firing when the magazine is not in place. The Zusatzsicherung is eliminated; the manual safety blocks movement of the trigger but does not lock the trigger bar; the nose of the manual safety locks the slide when the safety lever is pressed upward. Early guns retain the integral half-moon front sight of the Model 1913, but later models were available with a drift-adjustable front sight dovetailed into the raised portion of the slide top. The serial number is moved to the grip tang on the right side of the frame. Lockwork Design of the Behördenmodell. Patent drawing, German Patent No. 485710. Trigger, connector, & sear highlighted. In October 1930 starting with serial number 200000 the Behördenmodell 1930 was introduced which has several improvements in the lockwork. This gun has what is known as a safety trigger-- essentially a button on front of the trigger that has to be pressed in order for the trigger to be pulled. 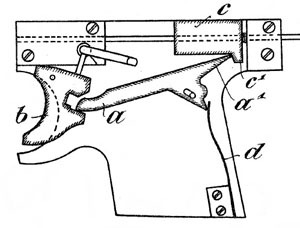 The design of the trigger and its interface with the connector still serve to disconnect the lockwork until the slide is in battery, but unlike the Model 1913 the Behördenmodel has a sear at the rear that is separate from the connector itself. as Sauer engineers worked to perfect the cartridge feed. The moveable cartridge guide was connected to a pin at the rear, such that when there was a cartridge in the chamber it moved the pin backward so that it protruded from the rear of the breech cap, serving as a true loaded chamber indicator. Early Behördenmodell pistols have the same polished slide with the inscription on top as the Model 1913, but later the top of the frame is lightly grooved to reduce glare, and hence the top inscrition is moved to the left side of the slide. There are a few aluminium frame and slide models known; we have noted several stamped on the right or left side ORIGINAL DURALUMIN. The two variations of this model are anodized (black) and non-annodized (brightly polished) Duralumin. These few pistols represent one of the rarest variations of all Sauer production pistols. The Behördenmodell 1930 can be found up to serial number 230000 (highest number known 227700). Between 225744 and 230796 there was a production gap. 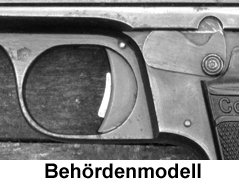 After 220000 some Behördenmodell 1930 can be found without the trigger safety. These late guns are somewhat similar to the Model 1930 but have the separate sear as well as the loaded chamber indicator. J.P. SAUER & SON, SUHL, PRUSSIA. Like the Model 1913, Variant 3, this model was improved with an additional safety (Zusatzsicherung) which blocks the trigger bar. In 1926 the safety lever was equipped with a nose which is used to lock the slide in its rear position, identical to the Model 1926. The slide catch in the top of the trigger guard is eliminated and the shape of the trigger guard is changed. The bakelite grips feature a larger S&S monogram in a vertical oval. 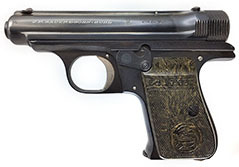 Gerhard Bock, in the 1923 edition of his book Moderne Faustfeuerwaffen und ihr Gebrauch, states that the Sauer & Sohn pistol which was introduced 1913 has a remarkable design, dimensions, quality, reliability and safety and that it is highly competitive with all other available .32 caliber pistols. The Model 1913 and its successors are known to be very reliable, even after 100 years. At the range we found the Sauer & Sohn pistols to be quite accurate. The sights are exellent, although very small. Due to its unique features the gun does not have problems with “stovepipe” jams. Remove magazine and make sure breech is empty. Press down on the rear sight and unscrew the breech cap counter clockwise. Remove breech assembly. With the right hand on the grips and left hand on the slide pull the trigger and ease the slide forward off the barrel. Remove the breech block to the rear. Remove the recoil spring from the front of the barrel. * The authors welcome corrections and further information about S&S pistols. We have been unable to examine in person the Model 1929 and 1930, and so would be grateful for information and photographs. Please write to edbuffaloe@unblinkingeye.com. BOCK, Gerhard, Moderne Faustfeuerwaffen und ihr Gebrauch. J. Neumann: Neudamm, 1923. CATE, Jim; KRAUSE, Martin, J.P. Sauer & Sohn, Volume II. Walsworth Publishing Co.: Marceline, Missouri, 2000. KOENIG, Klaus-Peter; HUGO Martin: Taschenpistolen – Taschen- und Miniaturpistolen Eine Auswahl aus 100 Jahren. Motorbuch Verlag: Stuttgart, 1985. NATIONAL RIFLE ASSOCIATION. Firearms Assembly II: The NRA Guidebook to Handguns. NRA, Washington, D.C.: 1972. TILLIG, H.J., “The Pistols of J.P. Sauer & Sohn.” Gun Collector’s Digest, 3rd Edition, 1981. TILLIG, H.-J., “Sauer & Sohn Pistolen 1900-1945,” Deutsches Waffenjournal, pp. 36-42, January 1983.